The Fun You Can Have By Finding Your Own Solutions. Every day I see on my Twitter feed requests to app developers to add more features. Things like adding a calendar view to a to-do list app or making an app more GTD (Getting Things Done) friendly. And yes some of these features might be nice, but when you reach out to other people to solve your problems for you you are missing out on an opportunity to learn some very valuable lessons. There’s a very good reason for not wanting developers to solve your problems for you and that is learning for yourself how to overcome minor issues. If life was as easy as requesting someone else solve your difficulties for you, we would already have been replaced by robots and computers. We haven’t and that’s because we have the ability to solve problems far better than a robot or computer can. 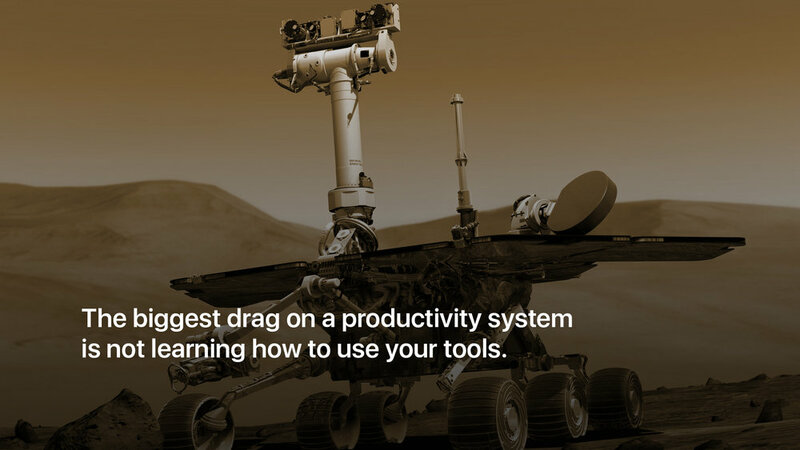 One of the biggest drags on a productivity system is not learning how to use your tools. If all you do when you come up against an issue that your current app does not solve is go looking for another app that will do what you currently want to do, you will only find later the new app doesn’t do something else you want to do so you switch again. You end up in a never-ending cycle of app switching and never spending any time learning how to get the most out any single app. Often all you need to do is spend a few minutes on Google and you are likely to find a workaround or a simple solution to your issue. One of my favourite past times is to take a problem, look at my existing apps and figure out a solution to the problem only using the tools I already have. In almost every situation I have been able to find a workable solution. I have never felt the need to reach out to developers and ask them to add another feature that would solve my problem. One of the most important skills one could have is the ability to solve problems. We see this again and again in articles about skills a person needs to protect themselves from automation. Asking someone to solve a problem or difficulty for you does not help you learn how to solve problems. You are just delegating responsibility to someone else. Instead, why not spend some time and figure out a solution yourself using only the existing tools you have. When the Apollo 13 space mission developed problems and put the astronauts in a life or death situation, Mission Control did not ask developers of the software to come up with a fix or a new feature. What happened was a team of amazingly talented people, together with the astronauts, looked at what resources they had available and came up with a fix that would get them safely back to earth. This scene from the film, Apollo 13 demonstrates perfectly how this team of incredibly talented people solved problems. It’s easy to write on a resume “I have good problem-solving skills”, but the question is: do you? Is your idea of problem-solving reaching out to developers and asking them to create a fix for you, or is it something you relish solving for yourself? Real problem solving is taking a set of imperfect circumstances and finding a solution using only the things you have available to you. Problem-solving is not about asking someone else to fix it for you. If you want to become better organised and more productive, then focus more on your system and less on the tools. Once you have mastered the art of collecting, organising and doing (C.O.D) and can do everything you have planned to do each day (the 2+8 Prioritisation System) without any difficulty, you will find you have less need for the tools you use and your productivity will skyrocket. Thank you for reading my stories! 😊 If you enjoyed this article, hit that like button below 👍 It would mean a lot to me and it helps other people see the story.